The CHSAA and GCHSAA played the Public Schools Athletic League (PSAL) in this year’s N.Y.C. 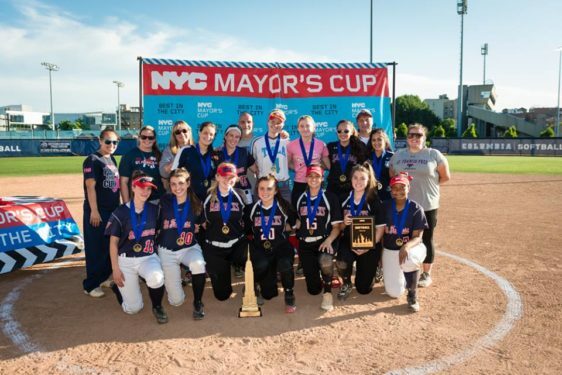 Mayor’s Cup baseball and softball games to be crowned “best in the city.” The GCHSAA softball team won its game, 13-3, while the CHSAA baseball team dropped its contest, 2-1. Diocesan softball players included seniors Taylor Matos (Archbishop Molloy H.S., Briarwood), Janina Pelaez (St. Saviour H.S., Park Slope), Tara Borst (The Mary Louis Academy, Jamaica Estates), Taylor Torres (Archbishop Molloy), Alyssa Mortellaro (St. John’s Prep, Astoria), Jazmin Andrews (St. Francis Prep, Fresh Meadows), Madison Reichert (St. Francis Prep), Sarah Williams (St. Francis Prep), Elizabeth Rocco (St. Francis Prep) and Jessica Ehret (Msgr. McClancy H.S., East Elmhurst). The team’s coaches were Frank Marinello from Fontbonne Hall Academy, Bay Ridge, and Katie Derby and Jessica Menna from St. Francis Prep. 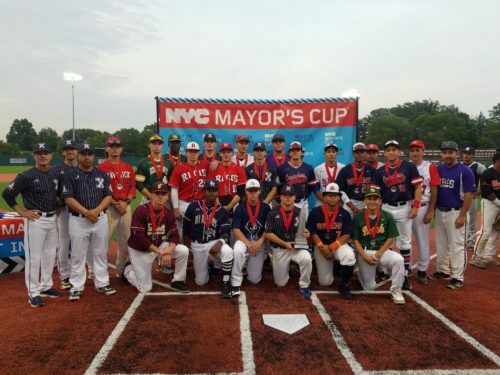 Diocesan baseball players included seniors Chris Betancourt (St. Francis Prep), Jaylen Palmer (Holy Cross H.S., Flushing), Jared Lerner (Xaverian H.S., Bay Ridge), Shane Mugnolo (Xaverian), Shamus Connolly (Xaverian), Kyle Schaefer (Msgr. McClancy), Ryan O’Hagan (Holy Cross) and Lou Lombardi (St. Edmund Prep H.S., Sheepshead Bay). The team’s coaches were Frank Del George from Xaverian, Joe Romano from St. Edmund’s and the recently retired Nick Melito from Msgr. McClancy. The Mary Louis Academy, Jamaica Estates, has announced that its cheerleading squad will be a fixture on the sidelines this fall at Fordham University, the Bronx, football games. The Rams are members of the NCAA Division I’s Patriot League.